My size is sold out temporarily! What do I do know? We aim to have all our retro clothing in stock in all available sizes - usually XS-XXL. However, we cooperate with relatively small companies and besides that we offer exclusive collections. This means that most items are only available in a few shops in the Netherlands or even in Europe. 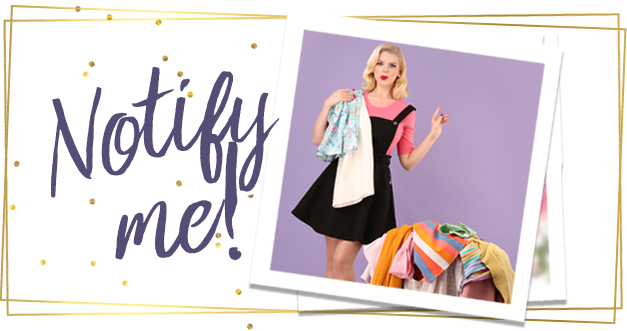 As the largest retailer from Pinup Couture in Europe, most of the collection is exclusively available at TopVintage. Besides that, a large part of our clothing is especially produced for us, but never in huge amounts like for example chain/department stores like H&M. Our waiting list system - Notify me! To be able to assist our customers the best way possible, we use so called waiting lists. In every product description we mention the most up to date delivery information (so whether an item is still available and when the product will be back in stock again) and by clicking on the requested size of the temporarily sold out product you can easily leave your e-mail adress behind. You will then automatically receive a message as soon as the requested item is back in stock and has been added to our website. We don't make promisses we can't keep! At TopVintage it is not possible to pay for a product in advance: we do not ask to pay for products which are not in stock, furthermore we do not wish to make any promisses unless we are 100% certain we can keep them! We always depend on the production process speed of our suppliers, the delivery speed of our shipping companies and in many cases the clearance process of the Customs office. Only as soon as an item arrives / is in stock you will receive a message, so that you can place an order through our website.